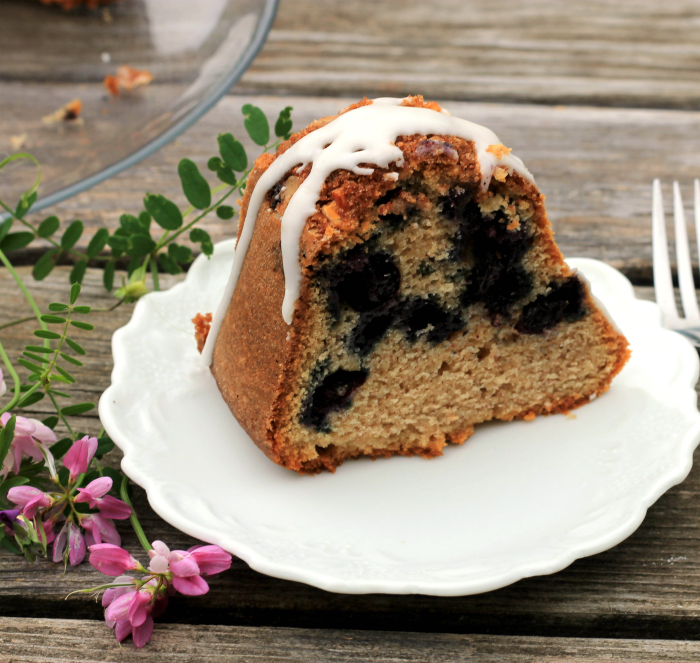 I love the blueberries at this time of the year… perfect for the blueberry breakfast bundt cake. I love this time of year. When I enter a grocery store at this time of the year, I love going to the produce center. I think that I could fill my basket with just fresh summer fruits. This past weekend the blueberries were on sale and I couldn’t stop myself from purchasing some for baking. Our kids were all headed home for the weekend. There was a baptism for our new grandson and a birthday party for my brother, all on the same day. Talk about a busy day. I knew that it would tough getting out of the house on Sunday morning to get to the baptism on time, so I wanted something that would be fast to eat and something that everyone would enjoy. 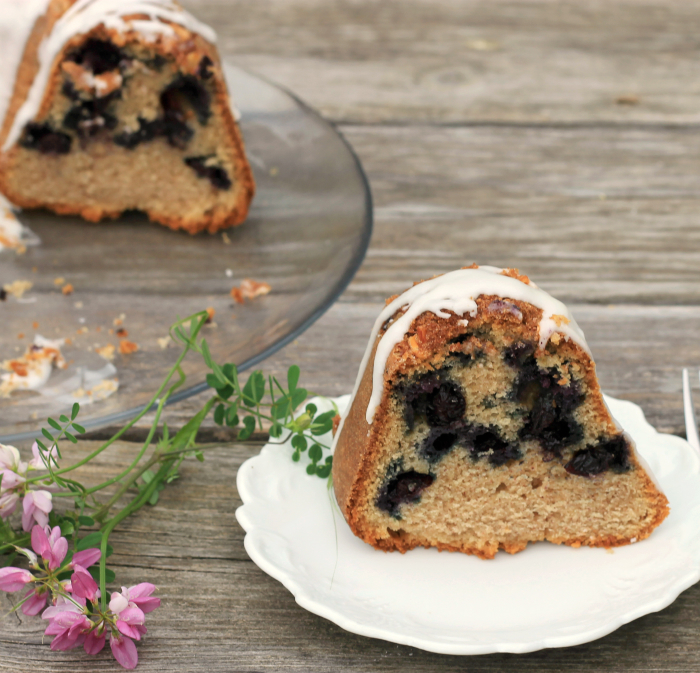 Who doesn’t love a yummy blueberry breakfast cake, right? Well, I found out that everyone enjoyed this cake and I have to say that it was a hit. 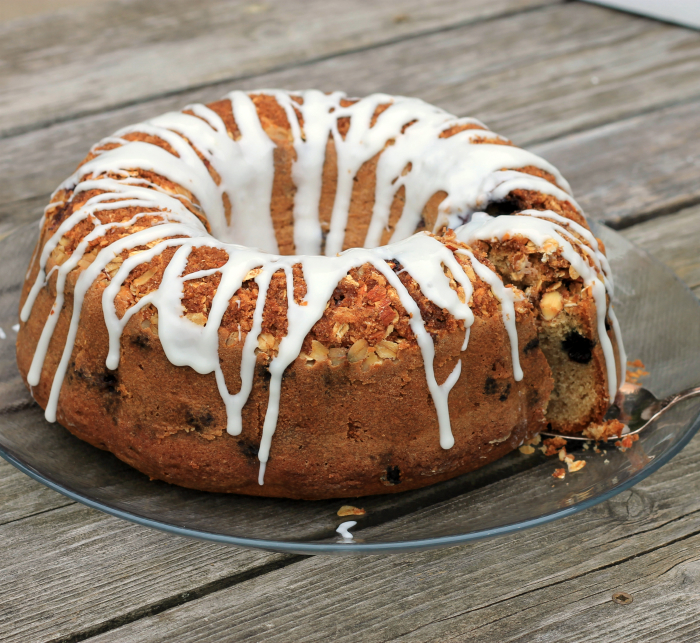 I have made this blueberry breakfast cake a few times now and each time I change it up a bit. This time around I added oats, brown sugar, finely chopped almonds, and cinnamon for a topping. I believe this is my favorite so far. I added some frosting, well just because. Preheat oven to 350 F. Grease and flour a bundt cake pan. 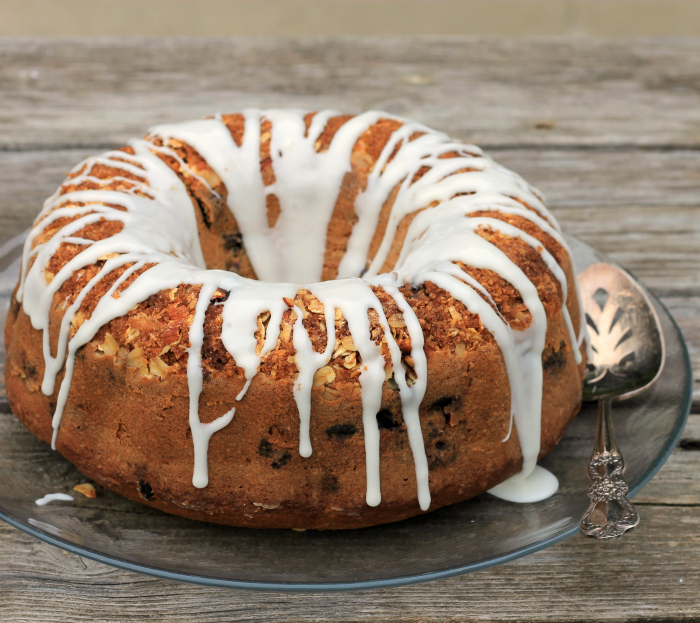 Mix together the 1/4 cup oats, 1/4 cup brown sugar, 1/4 cup chopped almonds, and 1/2 teaspoon of cinnamon and add to the bundt pan making sure that it is evenly distributed. In a large mixing bowl add the butter and sugar, with an electric mixer beat until fluffy. Add the eggs one at a time mixing after each egg. Add the almond extract and sour cream and mix until blended. Sift together the flour, baking powder, baking soda, salt, and cinnamon. Add to the egg mixture and mix until well blended. Fold in the blueberries until all blended. Pour the batter over top of the oats topping. Place into the preheated oven and bake for 50 to 60 minutes or when a wooden pick is inserted and comes out clean. Take out of oven and remove cake from the bundt pan as soon as it is out of the oven. Set on a cooling rack and cool completely. Once the cake is cooled mix the frosting. In a small bowl and all the ingredients and beat until smooth and creamy. Drizzle over cake. I love when I keep updating a recipe until it’s perfect. I think you’ve got this recipe to that point. I love the idea of having a healthy fruity cake for the breakfast. The cake looks splendid, Dawn. This is my kind of breakfast! Heck, I’d like this for dessert. 😉 Perfect for all the blueberries I’m seeing in stores at the moment. Thanks so much!